This section is from the book "The Boy Mechanic Vol. 2 1000 Things for Boys to Do", by Popular Mechanics Co.. Also available from Amazon: The Boy Mechanic, Vol2: 1000 Things for Boys to Do. The length of time required for the slide of a plate holder to be removed on a reflecting camera spoiled many of my plates, because strong light would enter the unprotected slot when the camera was in certain positions. To protect this slot so that the slide could be left out indefinitely, I made a cover of a piece of sheet metal having three slots, to admit screws turned into the camera. A knob was attached at the center. The illustration shows the application of this cover. In Fig. 1 the plate holder is shown slipped in with the cover back, and Fig. 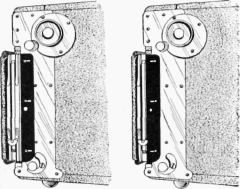 2 shows the slide drawn and the cover over the slot opening. - Contributed by B. J. Weeber, New York City.